A bit of housekeeping first - Blogger has added its own number captcha code in the comment section of blogspot blogs - like mine! Everyone is searching for a way to remove it because those codes are so annoying! So far we can't get rid of it. But what we have discovered is that you don't need to enter it - just comment and click post and it will work the same as always. Hope that helps as you visit and comment in blogland! 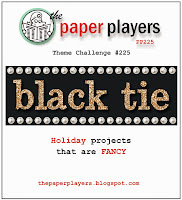 Pals Paper Arts has a terrific sketch challenge for us this week! This is definitely the busiest week of the year for me. It is my daughter's birthday, my birthday, Christmas Eve and Christmas Day all in a span of 10 days. It does take some juggling to assemble the troops four times in that span and try to keep each gathering unique! We celebrated with pizza, wings and cupcakes for my daughter last night. 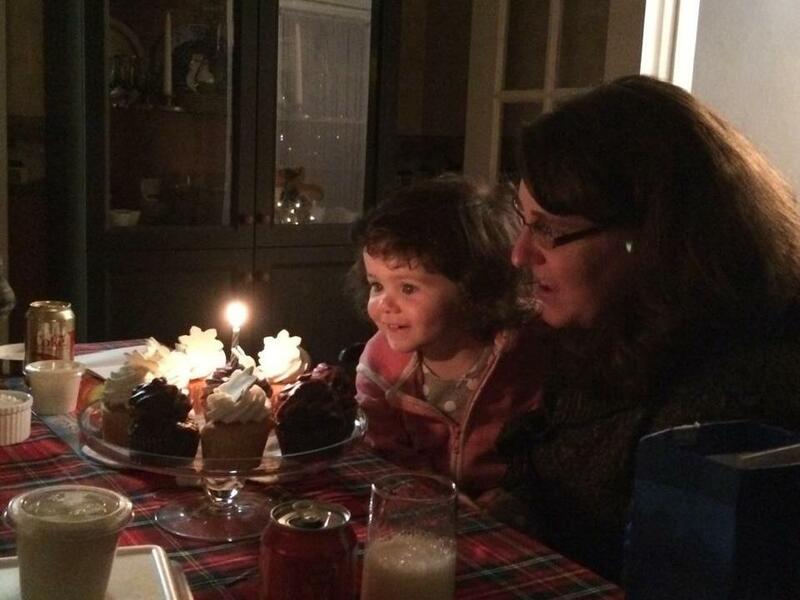 It is so much fun when you have a little one in the crowd who is just enamored by candles, cupcakes and ice cream! Narelle designed a wonderfully layered sketch for us this week at Freshly Made Sketches. 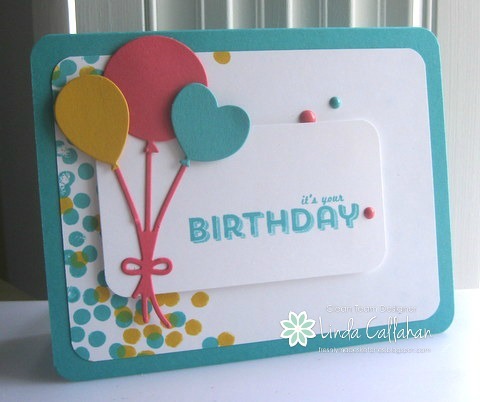 It was great to take a crafting break and design a simple birthday card for a friend. Hope you get to take a break as well and join us! 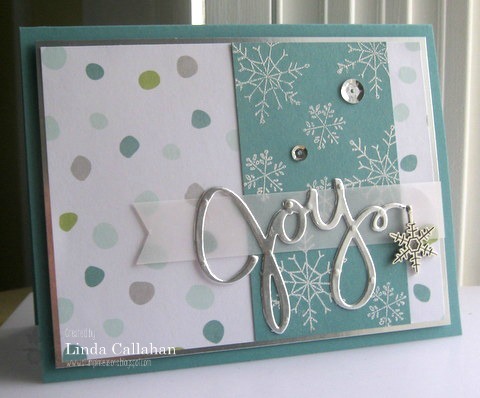 That wonderful and oh-so-talented Cindy Beach has nominated me for a Creative Blog Hop. That means I get to share my creative process with you by answering 4 simple questions - so here we go! 1. What are you working on? Christmas, Christmas, Christmas! Finishing cards, writing out cards and making a few last ones just in case! Here's a peek at my desk this week! 3. Why do you create what you do? I loved doing bulletin boards when I taught school After I retired I missed working with paper and design. 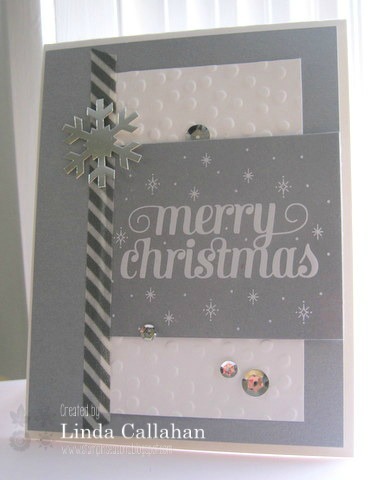 I look at each card as a mini bulletin board - each with its own theme and personality! I rarely make more than one of the same card - except at Christmas - most of my cards are created with a specific person/occasion in mind. 4. How does your creative process work? I like to start with a sketch. Then I pull stamp sets from my bookcase looking for images that would fit. When I decide on the set I start picking colors and Designer Paper. 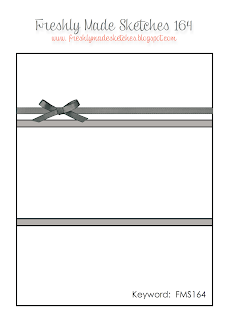 Of course there are those times when I start with the Designer Paper and work this process backwards! I used Natural Composition Designer Paper and whitewashed it slightly with white ink so that the notes stand out in the background. 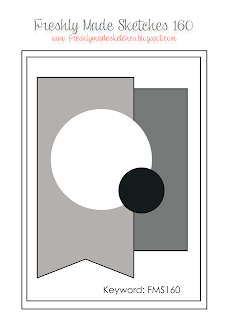 I have passed the baton on to Debbie Crowley at expressively deb.....she is also mostly a CAS designer with a wonderful eye for color and composition. I enjoyed meeting her at a gathering last year - she has a great smile and is such fun to chat with! Her post about her creative style will go live next Monday....Dec. 22nd. Blogger has taken it upon itself to add a number captcha code if you leave a comment. Unfortunately no one has found a way to remove it yet. But in the meantime we have discovered you can skip it and just hit "post comment" as usual......hope that helps as you travel around in Blogland! Christmas activities are in full swing around here. The tree is up, my shopping is done and I am finishing the last of my holiday cards. Winter is off to an early start here so I'll be staying in the next day or two wrapping packages and baking while another foot of snow falls! 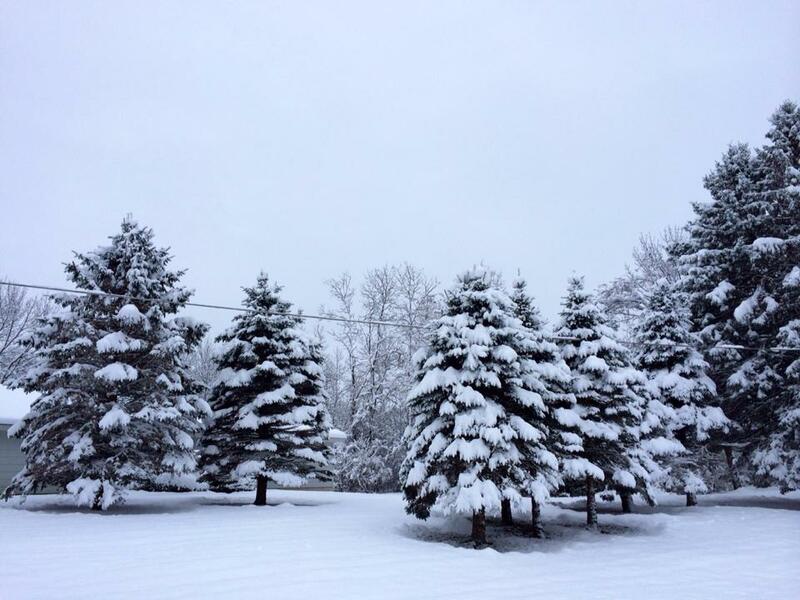 Nothing like snow to bring on the Christmas spirit! That oh-so-talented gal from New Zealand - Karren - has designed a sweet sketch for us at Freshly Made Sketches - hope you play along! Not a flake in sight these days where she lives! 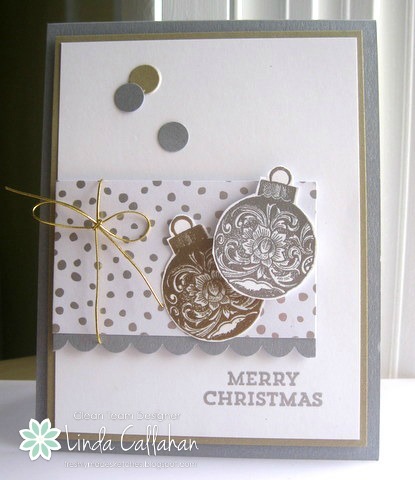 I dressed up Karren's sketch in silver and gold with embossed ornaments. A gold cord tie and my card is ready to deliver an elegant Christmas greeting - just right for the Paper Players Challenge this week as well! 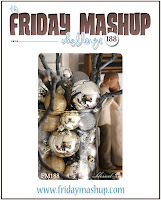 Friday Mashup is also having a Silver/Gold/Holiday theme this week! Oh these colors have a down home feel to them at Pals Paper Arts! 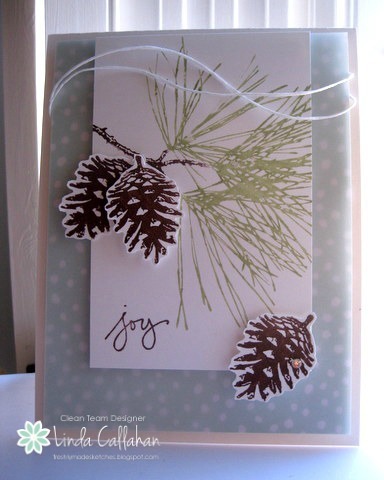 I used Ornamental Pine and Wondrous Wreath along with the sketch from Cas(e) This Sketch to create my card this week. And that off center paper piercing just makes me smile. As some of you have realized by now, I do tend to like things slightly askew! 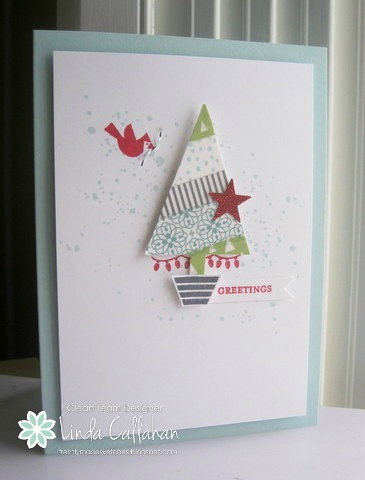 Pals Paper Arts has a wonderful homespun color challenge for us this week! Hope you play along! I adore this sketch by Cindy Lovell this week at Freshly Made Sketches! Hope you play along! 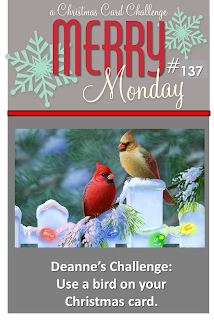 Merry Monday's Christmas challenge this week is to use a bird - or two - on your holiday card. Guess who returned home safe and sound??? Yep it is Hip Hip Hooray! I was so excited to see him that I inked him right up on a birthday card! Pals Paper Arts had a really neat sketch this week that reminded me of the bokeh technique so I went with it and sponged lots of soft white circles over a watercolored panel. And where was Hip Hip Hooray you might be wondering? 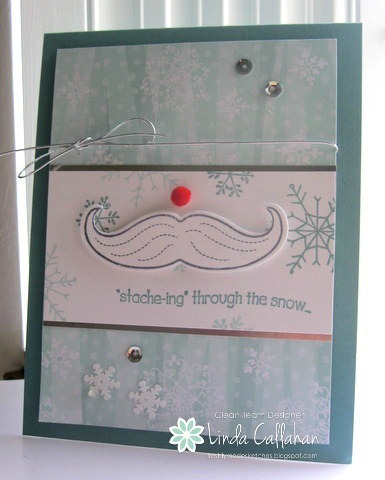 Well he didn't get too far........looks like he spent the week on my bookshelf stuck to the back of my Stampin' Up! catalog! When I asked my niece what her 8 year old daughter would like for Christmas she responded "Anything with mustaches!" I had no trouble finding shirts, mittens, wrapping paper and party props - mustaches are everywhere! Of course I had to make a card especially for her as well. We will see them Thursday at our annual Thanksmas celebration. We gather with my husband's side of our family on Thanksgiving and celebrate both holidays so everyone can be home with their kids on Christmas Day. It is a wonderful way to kick off the holiday season! 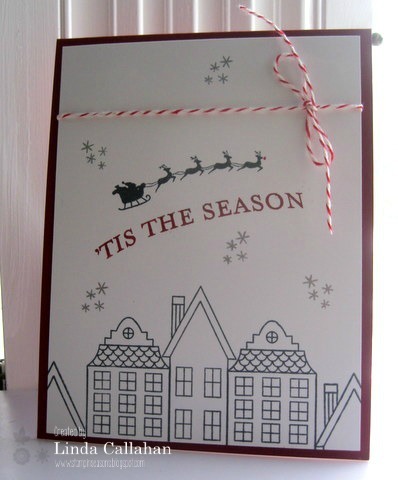 Even though I make a variety of Christmas cards I try to keep the same color theme on my cards each year. 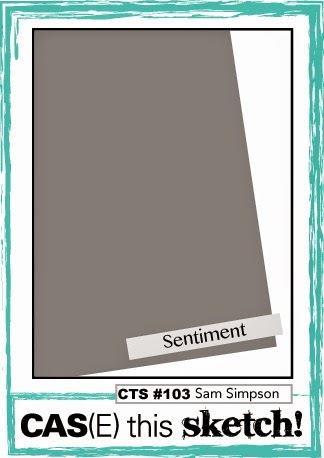 This year (as you have probably noticed) it is silver, white and those wonderful shades of blue - Lost Lagoon, Pool Party, Soft Sky - along with All is Calm designer paper. 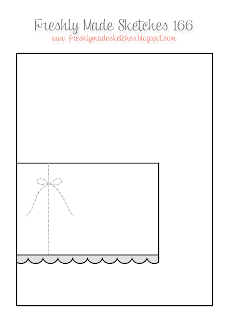 I also made a few "easier to mail" versions of this card. 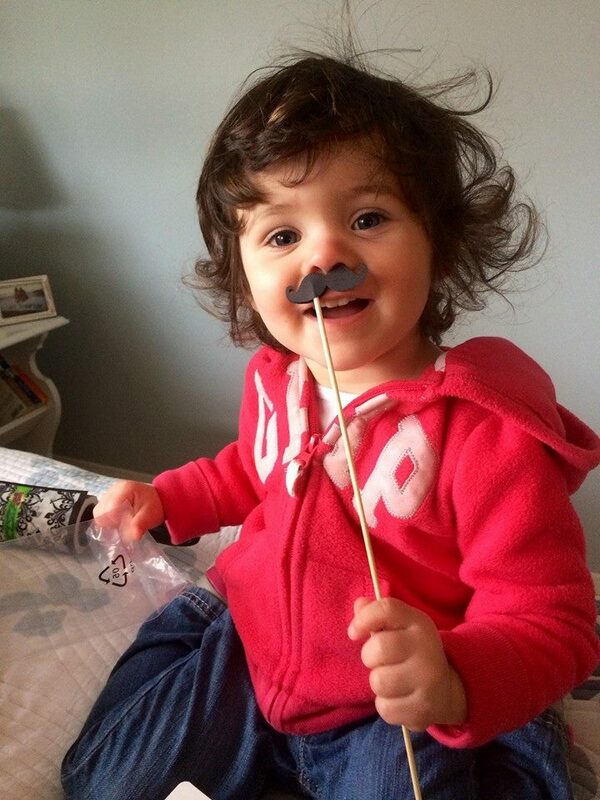 But in the meantime Emma must-ache you a question......she likes the red nose card best.......what do you think? Jen Brum's terrific sketch is wide open for lots of creativity this week! Hope you join us at Freshly Made Sketches! Hope to spread some joy today to those of you who may have struggled to remove words or intricate pieces from thin dies. I came across this video on Facebook and thought I would share the news. Karen Burniston demonstrates how to use dryer sheets to make those tiny pieces slide right out! 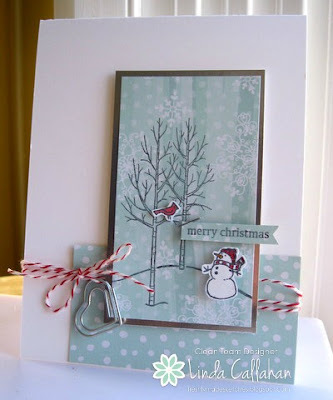 It really is amazing and definitely brought me joy as I added a few of these cards to my holiday stash! 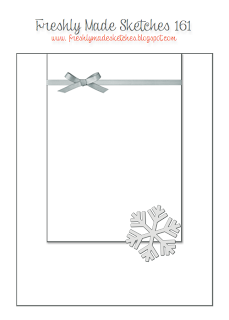 The snowflakes from Endless Wishes embossed in white on the middle panel aren't the kind that need shoveling. I live about three hours from the Great Lakes where communites have been buried in 5 feet of snow - with another foot or two expected. Convoys of snowplows left our area to help out. We have escaped with just frigid temps, wind and flurries. 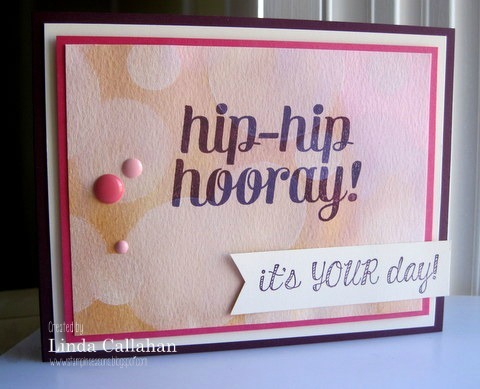 In the meantime I have received many comments and emails from many of you about my Hip Hip Hooray stamp that has escaped from my craft room........there have been "sightings" as far south as Georgia and as far west as Arizona..........oh will he ever return?????? 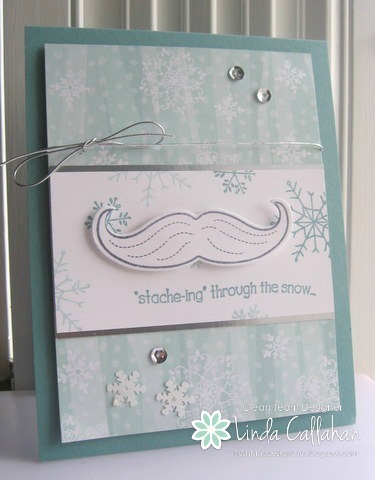 Pals Paper Arts has a sketch challenge this week - hope you play along with this very versatile sketch! Put your own stamp on it! 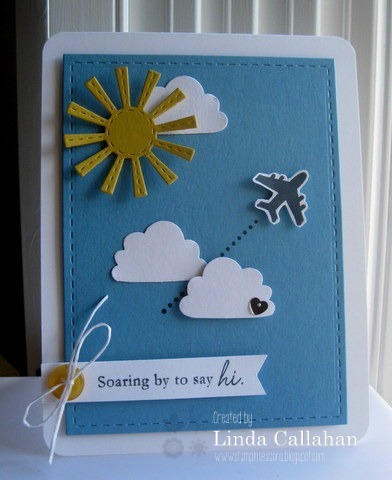 Cindy has a fun sketch for us this week at Freshly Made Sketches! Hope you join us! Today I was visiting CAS(E) This Sketch and decided to play along using their wonderful sketch. 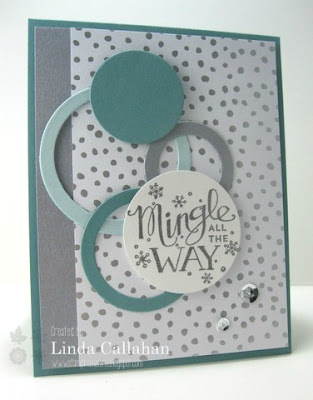 My friend Lesley Croghan is on their DT so I stopped by her blog and there I learned about a fun link up going on at Amy Tsurata's blog. 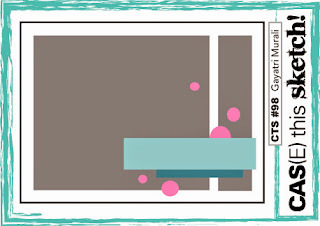 Amy is celebrating 7 years of blogging by revisiting a post from her first year and has challenged us to upload a card from our first year of blogging. 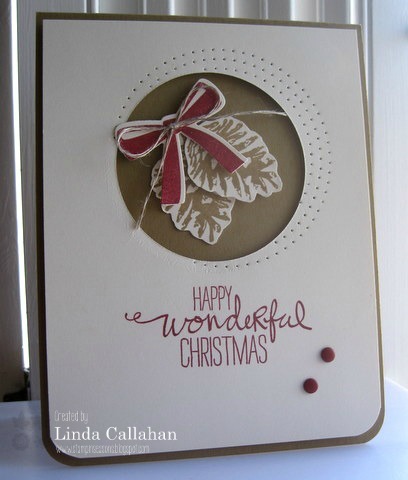 I started blogging five years ago in August 2009 and posted this card that November for a Pals Paper Arts Challenge. 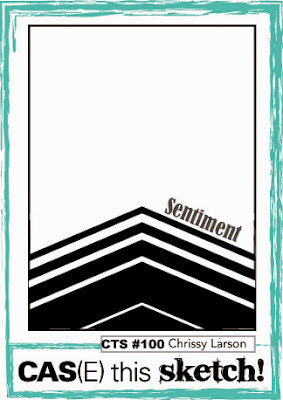 Hope you enjoy "yesterday's" card! 1- Forgot my umbrella for my morning walk but the sprinkles that started when I was a mile from home cleared up in two minutes.....who needs umbrellas? 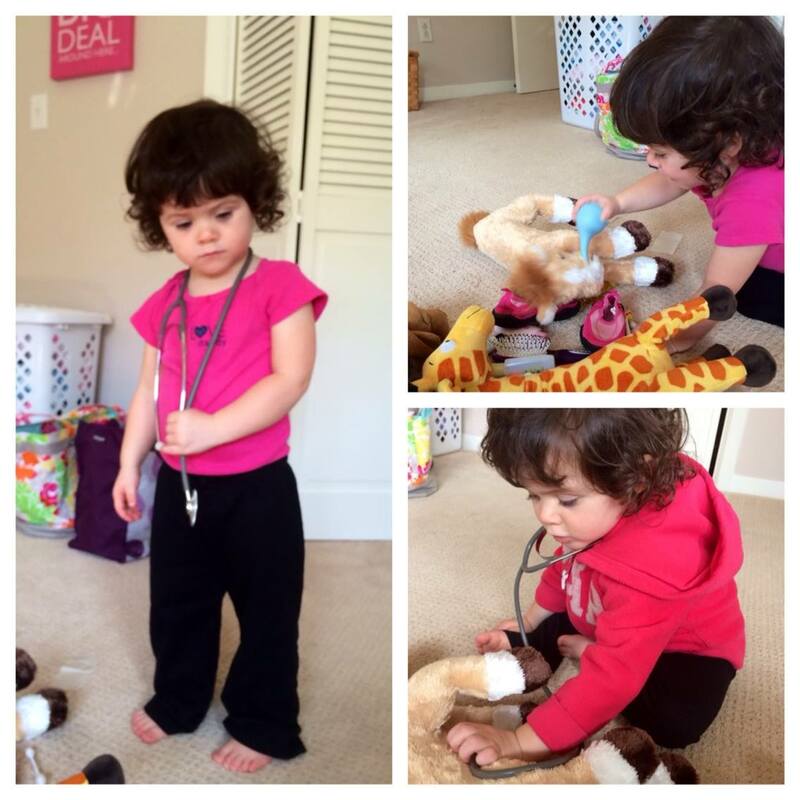 2- The dog has an infection and needs people antibiotics - yikes - but they were only $14.57! 4- My husband just remembered he needs to bring chocolate chip cookies to a meeting tomorrow so guess who had to get busy in the kitchen? Oh but now there are warm chocolate chip cookies in the kitchen and the CMA awards on TV.........definitely thankful! 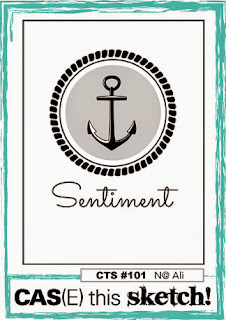 And I am thankful to be part of this wonderful online stamping community! 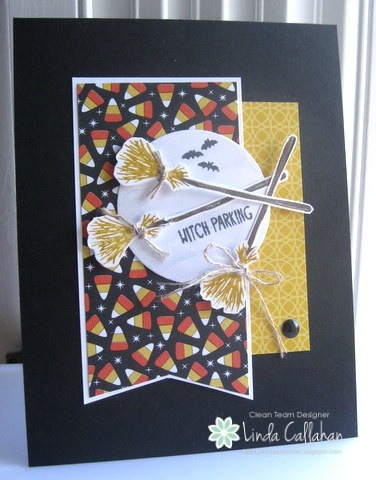 We have a great fall color challenge at Pals Paper Arts this week. Hope you play along! I was also inspired by the cool sketch from CAS(E) this Sketch. Hmmm the title of this post might remind you of the Pillsbury Dough Boy but I am actually talking color here today. 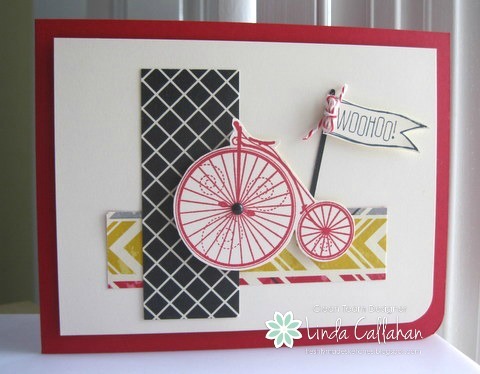 At a recent Stampin' Up! gathering we were asked to name our favorite SU! color. The moaning and groaning that followed was incredible but our leaders - Brian and Pam - held firm. We had to name one color and boy was that hard to do! Strong colors like Real Red, Blackberry Bliss and Cherry Cobbler were very popular - and those colors crossed my mind for sure - but when it was my turn the words Soft Sky just popped out. 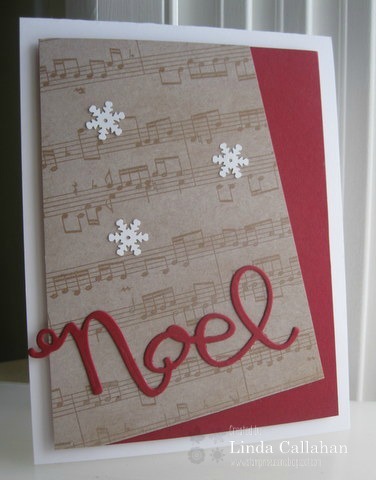 I have used it here in my Christmas card - softened even more with a piece of vellum layered over it. 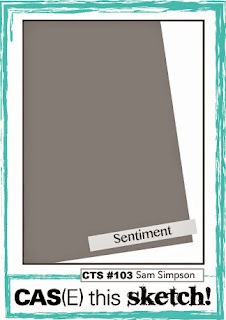 It is one of those colors that always seems to add a sweet fresh look to a design. 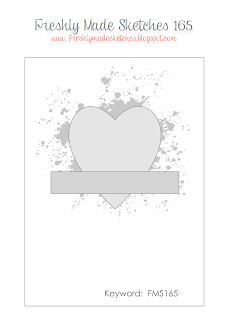 Exactly the look I was going for today since I created this for Freshly Made Sketches! I am hosting this week and would love to have you join us at Freshly Made Sketches and play along using my sketch! I'll by dropping by to see your wonderful creations!